The popular "bad to the bone" look meets the royalty craze with our Crowned Crossbones Dog Hoodie in Raspberry Sorbet. 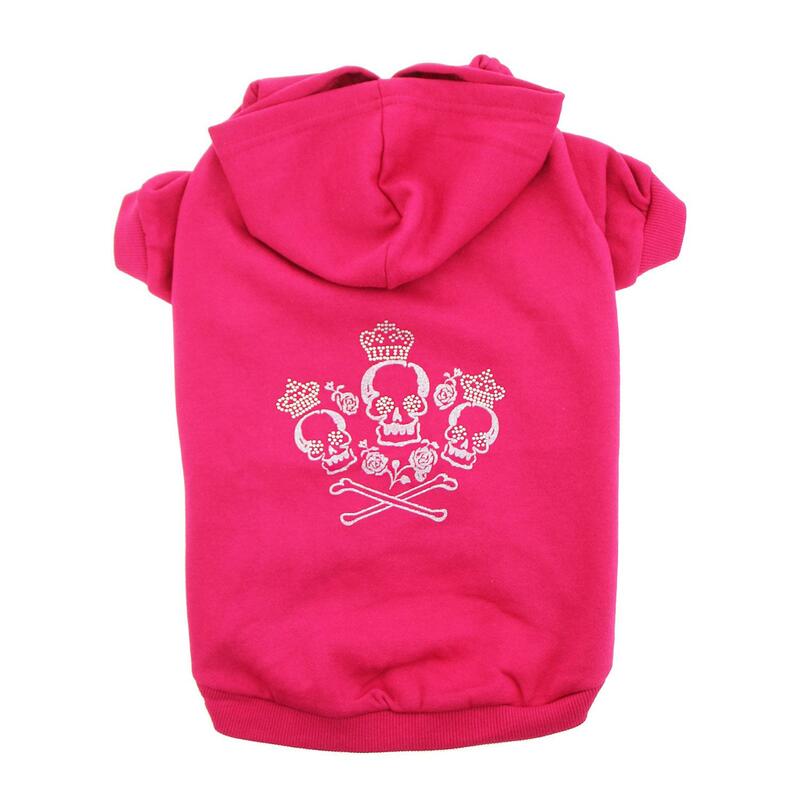 Our Zack & Zoey™ Crowned Crossbones Hooded Dog Sweatshirt in Raspberry Sorbet features a cool silver print with crossbones, crowns, and roses with regal rhinestone accents. This dog hoodie will give your pup some rebel style that's enhanced with bling! This dog sweatshirt will turn heads and have everyone adoring your taste in dog clothes and have even cutie pups looking a bit tougher! Just because your pup wants to look a little more "ruff" doesn't mean they want to be pampered less. This soft, comfortable knit will help keep your pet toasty warm on chilly days. It's perfect for lounging around the house or for walks around the 'hood. This stylish dog hoodie would make quite an impression for dogs going to Sturgis or just the local motorcycle shop. Don't forget to send us your photos of your pet in this fun dog sweatshirt. Who knows? Your pet could be our next Pet of the Day with a chance to win a BaxterBoo.com shopping spree! Please note, this hoodie runs a little smaller than our Basic Dog Hoodies. Crowned Crossbones Dog Hoodie - Raspberry Sorbet Customer Photos - Send us your photo! Was purchased for Athena but it was to small and now that Phoenix has grown up, it is the perfect size for her start of fall wardrobe!! Lucy loves this hoodie so much and loves sleeping in it. Perfect for Michigan winters. The small fits her with room to spare - she is 9 lbs, length 11", chest 15", and neck 9". Bambi is a maltipoo who is super smart and loved by the entire family. She belongs to my daughter and is Zuzu's sister from another litter :-). She stays with us often and so I had to buy her this cool sweatshirt and she looks adorable in it and the small fits her perfectly. She weighs 6lbs if that will help someone else with sizing. Chauncey is getting older -- and loves his hoodies here at the beach! Haru loves her hoodie, perfect for layering. Chloe doesnt like to wear many clothes but her pink hoodie is her favorite out of all she has..
Roxie sporting her new hoodie while getting ready for our morning walk. She is an eight pound love bug and this size small is a perfect fit! They are both rescues and are Chihuahua mixes. Loki is wearing Hercules's old Zack and Zoey sweatshirt in black and Hercules is wearing his in Raspberry. They look adorable and enjoy wearing them. I just love my "BaxterBoo" hoodies. They keep me so warm in the winter's when I go out to play in the snow. I think I'll put snow booties on my Christmas list this year cause MY PAWS ARE COLD OUT HERE!!!!! She's adopted. And she rocks! My husband loves the skull and cross bones, it took me forever to find puti a shirt like this she loves it! Aly loves her new hoody!! Santa came early thanks to the cold front. They look sweet but they are bad to the bone ;-). I am so warm on walks in this hoodie! Zoe staying warm & stylish in her new Crowned Crossbone Hoodie from BaxterBoo! Rockin' my new Zack and Zoey Crowned Crossbone Hoodie from BaxterBoo! Bella enjoying her stylish new hoodie from BaxterBoo! Keeping warm in my favorite hoodie! Leah loves her bling hoodie, especially when she can show it off at the dog park. Khaleesi posing in her new hoodie! She loves it! Roxy loves her nice warm hoodie! Roxy's new hoodie keeps her nice and warm in the cold Iowa winter! Fits perfect, love the rinestones, i love a little bling bling for her! Girls can wear cammo and boys can wear pink, especially if they are pitbulls. Even cuter in person, she loves to wear it, keeps her nice and warm. Posted On 11/16/18 by Emily L from , KY Yes, Emily L recommends this product! We love this shirt. It is a perfect fit for our 50-pound staffie mix. Posted On 10/04/18 by Grand Rapids from Grand Rapids, MI Yes, Grand Rapids recommends this product! Was to small for Athena but Phoenix is now big enough to wear it this start of fall and she LOVES the bling!!! True to size and pretty pink color. Posted On 10/03/17 by Deanna S from Brighton , UT Yes, Deanna S recommends this product! This is so cute on my puppy, she’s 13 pounds and a medium fit perfect. Will definitely buy again and love the pricing Baxterboo offers. Keep it up!! The skull image is alot smaller than I anticipated. You can barely make out what it is supposed to be. Cute, wouldn't purchase again though. Posted On 01/29/17 by Rachel N from The Dalles, OR Yes, Rachel N recommends this product! Fits my Pitbull perfect. Great quality. I'm going to order it in black as well. Posted On 01/15/17 by Karen S from Cedar Springs, MI Yes, Karen S recommends this product! Looks great, feels great, hardwashes great, what else can I say.......... It is a great hoodie and such a great color! Love the fit of the fleece hoodies! Posted On 11/13/16 by Lisa B from Brimfield, IL Yes, Lisa B recommends this product! I love this hoodie and is so appropriate for my girl's personality. The Small was a little small (15 lb Westie) so I exchanged it for a medium which is just a little big but we will make a couple of alterations and it will be fine. Posted On 11/07/16 by Deni S from New York, NY Yes, Deni S recommends this product! Posted On 11/06/16 by Denise M from Clermont, FL Yes, Denise M recommends this product! We ordered this for our little Maltese because she gets cold when we have her out on chilly nights. It is going to be great for her when we go on ghost tours because it is well themed and we won't have to wrap her in our jackets and carry her. Posted On 10/08/16 by Deni S from New York, NY Yes, Deni S recommends this product! Looks fabulous on my daughters malti-Pooh. Very cozy and fits her just right ! Posted On 08/29/16 by Deni S from New York , NY Yes, Deni S recommends this product! Posted On 04/21/16 by Lynn W from Lincoln City, OR Yes, Lynn W recommends this product! I can't even count the number of these Z&Z "Crowned Crossbone" sweatshirts we've owned. They fit both our Lhasas beautifully. They wash perfectly. They are well-made, warm, and amazingly cute. Our Chauncy depends on them as he ages because he is so cold natured. The little pirate design in metal studs is also very cute -- especially on a fluffy lhasa. -- sort of a wink at looking tough for such frou-frou little guys. Posted On 03/07/16 by Bethany G from Harrisburg, PA Yes, Bethany G recommends this product! I bought these same sweatshirts for my pups many years ago. I was so pleased to find them here. They are the same good quality. Posted On 02/25/16 by Chanda F from West Fargo, ND Yes, Chanda F recommends this product! Was very impressed with the quality of this hoodie. The hoodie fits my American Staffordshire perfectly and is very soft. Definitely am happy with the purchase! Posted On 02/19/16 by MaryCollins S from Alturas, CA Yes, MaryCollins S recommends this product! This is a really cute, warm and well-made hoody. It is easy to put on and take off looks adorable on my Pap. I put it on for daily winter walks to keep them clean, warm and dry. One note, for boy dogs the hoody is a bit long underneath. It is best to use on girl dogs or alter the shirt a bit to avoid soiling when the leg goes up! Wonderful and fun hoody! Posted On 02/04/16 by DEBRA S H from Ripley, WV Yes, DEBRA S H recommends this product! I love these Zack & Zoey sweatshirts. They fit well and are so cute! I've reordered them in different colors and given them as gifts. Posted On 01/10/16 by Christel C from Peoria, AZ Yes, Christel C recommends this product! My little girl looks too cute in her hoodie. It fits her to a tee, and the color pops against her black and tan coat. She fights like the dickens for me to put it on, but when we return she doesn't want to get out of it. She is an xs, but she has a long body so not everything covers her torso.This gives her just the right amount of coverage. She can move freely, but have some modesty when she does her business. Posted On 01/08/16 by lisa l from san antonio, TX Yes, lisa l recommends this product! So soft and the decal is sweet. Roomy medium size so it does not rub under the legs. Washes great. Posted On 12/05/15 by Katherine M from Boca Raton, FL Yes, Katherine M recommends this product! Adorable! Well made! Runs small! Posted On 11/30/15 by Cindy B from Buffalo, NY Yes, Cindy B recommends this product! Posted On 11/29/15 by Heather C from Snohomish, WA Yes, Heather C recommends this product! This is soft, keeps her warm on these cold days. Posted On 11/21/15 by Margot H from , AZ Yes, Margot H recommends this product! Love my little girls new "Hoodie" it's perfect for the chilly mornings and just too cute. Posted On 10/05/15 by Amanda C from Clinton township , MI Yes, Amanda C recommends this product! Love this hoodie! It fits well I have a 55lbs pitbull and the XL fits her perfect. The design is well made and very sparkley. Cozy lightweight material perfect for chilly fall weather. Posted On 03/16/15 by Terri J from , CO Yes, Terri J recommends this product! Great color with the skulls and roses, fits so good! Posted On 03/05/15 by lucille m from bayonne, NJ Yes, lucille m recommends this product! This is the second one I've bought. The first was worn so much it started looked ragged. It's made so well and fits perfectly. Posted On 12/10/14 by Nicole T from Ames, IA Yes, Nicole T recommends this product! I bought this hoodie for my parent's Pit Bull and my Frenchie. It's so soft and the material hold us well to their rowdy shenanigans. My pup has several of the hoodies from this site and they all have lasted years. The hoodies I've remembered to keep out of the dryer and air dry still look almost new. Fits good, sizing was right on. Posted On 11/07/13 by Victoria C from Essex Jct, VT Yes, Victoria C recommends this product! We love this! Living in a cold climate this sweatshirt makes me feel better about taking our westie for long walks! Has been washed several times does not shrink! Thank you baxterboo! My favorite place to purchase accessories for my dog! 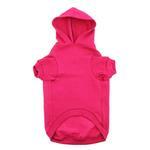 Always excellent quality and fast shipping with the biggest selection of pet clothes and accessories!